Descendents of Richard JOHNS and moving companies for relocation. The fortunes of posting research is that sometimes it proves to be not exactly as you would have it to be. Until such time there are other major updates I am leaving Roger JOHNS as part of my Johns Family Research and Lineage Page. These e-mails will explain this statement. 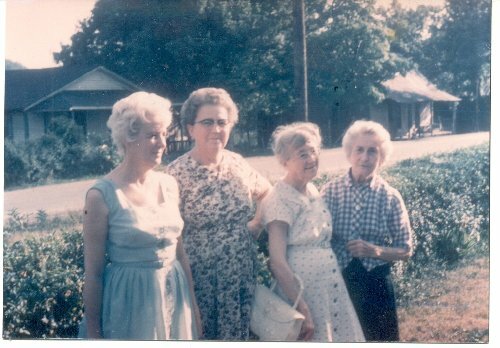 Left to Right - Polly Ann Johns Owen, Ethel Tiny Johns Didelot, Laura Alice Johns Crutchfield and Mattie Alice Livesay Payne. Made June 28, 1962 at Lone Mountain, TN at Mattie Alice Livesay Payne Home. Sent to me - Joe Payne by Newton Owens 1990. Some more pictures of John Rial Johns and Hancock Co., TN Johns Family. (1) Roger1 JOHNS married (2) Elizabeth. (3) Richard2 JOHNS, (Roger1 JOHNS) married spouse unknown. (4) William3 JOHNS, (Richard2 JOHNS, Roger1) was born about 1690 at King William Co., Va, and married (5) Ann. William died about 1775 at Amherst Co., Va.
More on William Johns of Cumberland, Buckingham and Amherst Co.'s Va.
(6) Robert4 JOHNS, Sr, (William3 JOHNS, Richard2, Roger1) was born about 1723 at King William Co., Va, and at poss. Albemarle, Va, married (9) Mary GRESHMAN. Robert died before 1778 at Amherst Co., Va.
(7) Thomas4 JOHNS, (William3 JOHNS, Richard2, Roger1) was born about 1725 at King William Co., Va, and married spouse unknown. Thomas died in 1787 at Cumberland Co., Va.
(8) William4 JOHNS, (William3 JOHNS, Richard2, Roger1) William died at Amherst Co., Va. He died intestate, apparently without wife or issue. (10) Nancy5 JOHNS, (Robert4 JOHNS, William3, Richard2, Roger1) was born about 1758 at Amherst Co., Va, and on Feb 7, 1790 at Amherst Co., Va, married (25) Nathaniel GUTHRIE. Richard enlisted in the military at the age of 17. He served under several commands including Capt. Benjamin Harris' Company in the Revolutionary war. He was a General in Revolutionary war and fought in the Battle of York Town where Cornwallis surrender. Richard was at Ft Boonesboro with Daniel Boone. There are several monuments to them as one of KT first families. Richard is one of 2 Revolutionary War Vets buried at Jefferson Barracks Cemt. at St. Louis. Richard traveled with his wife, Jane and one year old son, Reuben, following the wilderness trail through the Cumberland Gap to Ft. Boonesboro in Madison Co., KY in 1786. Jane was pregnant at the time with David. (11) Thomas5 JOHNS, (Robert4 JOHNS, William3, Richard2, Roger1) was born in 1759 at Amherst Co., Va, and on Apr 6, 1779 at Amherst Co., Va, married (26) Nancy MEHONE. Thomas died after 1824 at Floyd Co., Ky.
(12) Robert5 JOHNS, Jr, (Robert4 JOHNS, William3, Richard2, Roger1) was born about 1760 at Amherst Co., Va, and on Apr 6, 1779 at Amherst Co., Va, married (29) Elizabeth LYON. 30 + Elija6 JOHNS b. 1784 DIED IN BARRON CO. KY.
(13) Frances5 JOHNS, (Robert4 JOHNS, William3, Richard2, Roger1) was born about 1762 at Amherst Co., Va, and on Oct 19, 1794 at Amherst Co., Va, married (31) James MCCABE. (14) John Alexander5 JOHNS, (Robert4 JOHNS, William3, Richard2, Roger1) was born about 1770 at Amherst Co., Va, and on Jun 19, 1790 at Amherst Co., Va, married (32) Naomah (Oney) DILLARD. John Alexander died before Dec 21, 1801 at Amherst Co., Va. Naomah (Oney) died in 1837/1840 at Amherst Co., Va.
(15) Elizabeth5 JOHNS, (Robert4 JOHNS, William3, Richard2, Roger1) married before 1792 (38) John TYLER. (16) William5 JOHNS, (Robert4 JOHNS, William3, Richard2, Roger1) was born in 1755 at Amherst Co., Va, and in Dec 1790, married (39) ?????. William died abt. 1826 in Floyd Co. KY.
(17) Joseph5 JOHNS, (Robert4 JOHNS, William3, Richard2, Roger1) was born about 1766 at Amherst Co., Va.
(18) Benjamin5 JOHNS, (Robert4 JOHNS, William3, Richard2, Roger1) was born about 1768 at Amherst Co., Va.
(19) Sally5 JOHNS, (Robert4 JOHNS, William3, Richard2, Roger1) was born about 1774 at Amherst Co., Va, and on Oct 17, 1795 at Amherst Co., Va, married (46) Fleming DUNCAN. (22) Jesse5 JOHNS, (Thomas4 JOHNS, William3, Richard2, Roger1) married in 1783 at Va (47) Lucy SIMS. Notes for Jesse Johns and Could there have been three. (24) Henry5 JOHNS, (Thomas4 JOHNS, William3, Richard2, Roger1) was born in 1770 at Cumberland Co., Virginia, USA, and married (49) MARY who was born in 1777 at S.C.. Henry died at Mulberry, Hancock Co., Tennessee, USA and was buried at Mulberry, Hancock Co., Tennessee, USA. More Tennessee Johns families. Could they have been of the Thomas line too. Notes for Henry JOHNS: (There were clearly two Henry Johnses in the Grainger, Hawkins and Hancock Co. areas of East Tennessee during the years 1800 - 1830) One, the ancestor of Martha Ann Fetch. She writes the following regarding the Henry Johns of the 1830 Grainger Co. Census. Henry, father of Rial had moved from Hawkins Co. to "Johns Springs" in Kentucky and then back to Mulberry Gap where he purchased land. The association between the Johns Greenes and Trent families continued in Hancock Co., Tennessee where Rial Johns married Martha Alice Slaton, daughter of Capt. John Slaton. (Five of Capt. John Slaton's children married into the Jerimiah Greene family of Rowan Co., NC, one of Jerimiah's daughters married William D. Trent, brother to Alexander Trent from Cumberland Co., VA) A Henry was evidently in Hawkins County before Tennessee baecame a State. This deed of February 28, 1795 with Joel Gillenwaters (which I have some information on) attests to that fact. I am not at all sure that this was Henry father of Rial Johns. Newton Owens wrote this about Henry Johns, father of RIAL. Some Johns and Slaton Census Records These I believe are of my Henry and Rial Johns from Pendelton District, SC to Hawkins, Grainger and Hancock County, TN. i.DAUGHTER6 JOHNS, b. Abt. 1810. 17.
ii.RIAL 'ROYAL' JOHNS, b. December 12, 1812, Pendelton District, S.C.; d. November 12, 1898, Ivy Ridge, Flat Gap, TN. iii.SON JOHNS, b. Abt. 1813. I was hoping that you can help me on finding out about William Henry Johns born March 25 1855, died September 1942. I think that his birthplace is in Tennessee, and he is buried at Stateline cemetery, just north of Huntsville, Al; on the Tn-Al stateline. William is my great-great grandfather. My great-grand father is Charlie Douglas Johns, William's son. (28) Thomas6 JOHNS, Jr, (Thomas5 JOHNS, Robert4, William3, Richard2, Roger1) was born in 1786 at Amherst Co., Va, and on Feb 9, 1807 at Amherst Co., Va, married (53) Nancy LAYNE. Thomas died after 1827 at Ross Co., Ohio. (30) Elija6 JOHNS, (Robert5 JOHNS, Robert4, William3, Richard2, Roger1) was born in 1784 at Amherst Co., Va. Elija died at Barron Co., Ky.
(33) William C.6 JOHNS, (John5 JOHNS, Robert4, William3, Richard2, Roger1) was born about 1791 at Amherst Co., Va.
Notes for William C. JOHNS: Before 1848, he moved to Tazewell Co., IL. He was likely the father of Andrew of 1850 Tazewell Co., p. 91. (34) Lewis H.6 JOHNS, (John5 JOHNS, Robert4, William3, Richard2, Roger1) was born about 1793 at Amherst Co., Va, and on Jan 21, 1822 at Amherst Co., Va, married (54) Susannah A. (Susan) SIMPSON who was born at Va. Lewis H. died on Oct 27, 1859 at Hamilton Co., IL. Susannah A. (Susan) died on Aug 15, 1873 at Hamilton Co., IL. Notes for Lewis H. JOHNS: ? 1820 Charlotte Co., VA, p. 17 ? 1850 Hamilton Co., IL, census: "JOHNSON"
Info from Bernice TEDROW, Pueblo, CO.
(35) James D.6 JOHNS, (John5 JOHNS, Robert4, William3, Richard2, Roger1) was born about 1798 at Amherst Co., Va, and on May 1, 1824 at Amherst Co., Va, married (65) Frankey D. TINSLEY. (36) John Shepherd6 JOHNS, (John5 JOHNS, Robert4, William3, Richard2, Roger1) was born in 1799 at Amherst Co., Va, and on Jan 22, 1824 at Amherst Co., Va, married (66) Caroline Matilda TINSLEY. John Shepherd died in 1858 at Marion Co., Tn. Notes for John Shepherd JOHNS: Info from Shari WILLIAMS. (37) Nancy D.6 JOHNS, (John5 JOHNS, Robert4, William3, Richard2, Roger1) was born about 1800 at Amherst Co., Va, and on Dec 2, 1813 at Amherst Co., Va, married (82) Charles TYLER. (48) Thomas L.6 JOHNS, (Jesse5 JOHNS, Thomas4, William3, Richard2, Roger1) married (88) UNKNOWN. (50) JOHNS, (Henry5 JOHNS, Thomas4, William3, Richard2, Roger1) was born about 1810 at Cumberland Co., Va.
Information taken from Hancock County and Its People, Vol. 2, 1994. Page 143.
i.WILLIAM JAMES JUNIUS7 JOHNS, b. December 1838, Hawkins Co., now Hancock Co., TN; d. January 1934; m. ELIZA M. WOLFE. 26.ii.MARY SUSAN JOHNS, b. 1840, Hancock Co., TN; d. 1872, Hancock Co., TN. iii.MARTHA JOHNS, b. 1842, Hancock Co., TN; d. 1917; m. JAMES D.B. DEBOW, September 04, 1860 Hancock, Co. TN 27.
iv.JOSEPH JOHNS, b. January 1844, Hancock Co., TN; d. November 1925, Hancock Co., TN. 28.
v.LUCINDA LUCY JOHNS, b. October 1845, Hancock Co., TN; d. January 1926, Middlesboro, Bell Co., KY.
vii.RUTH JOHNS, b. June 1849; d. November 1926.
ix.ADALINE JOHNS, b. May 1854; d. December 1925. 29.
x.NANCY ANN JOHNS, b. March 30, 1855, Hancock Co., TN; d. June 13, 1940, Mooresburg, TN. 30.
xi.JOHN RIAL JOHNS, b. November 1860, Hawkins Co., now Hancock Co., TN; d. September 11, 1939, Brushy Creek, Clinton, TN. 31.xii.ELIZABETH SLATON JOHNS, b. April 19, 1863, Hancock Co., TN; d. February 14, 1957, Knoxville, TN. (52) JOHNS, (Henry5 JOHNS, Thomas4, William3, Richard2, Roger1) was born about 1815 at Cumberland Co., Va.
(55) James Delaware7 JOHNS, (Lewis6 JOHNS, John5, Robert4, William3, Richard2, Roger1) was born at Charlotte(?) Co., Va, and at IL, married (103) Harriet M. ----- who was born at IL. James Delaware died at IL. (56) Dabney W.7 JOHNS, (Lewis6 JOHNS, John5, Robert4, William3, Richard2, Roger1) was born at Va.
(57) Nancy P.7 JOHNS, (Lewis6 JOHNS, John5, Robert4, William3, Richard2, Roger1) was born at Franklin(?) Co., Tn, and on Mar 8, 1857 at Hamilton Co., IL, married (112) James GOLBREATH. (58) Leroy Caswell (Cass)7 JOHNS, (Lewis6 JOHNS, John5, Robert4, William3, Richard2, Roger1) was born at VA or TN. Leroy Caswell (Cass) died on Sep 15, 1882. (59) Granval D.7 JOHNS, (Lewis6 JOHNS, John5, Robert4, William3, Richard2, Roger1) was born in Mar 1836 at Franklin(?) Co., Tn, and on Nov 23, 1854 at Hamilton Co., IL, married (113) Anna E. (Fanny) BEASLEY who was born at Tn. Granval D. died in 1914 at FULTON CO., Ar and was buried at Gobblertrot Cem., FULTON CO., Ar. Anna E. (Fanny) died at IL. (60) William Carroll7 JOHNS, (Lewis6 JOHNS, John5, Robert4, William3, Richard2, Roger1) was born at Tn. (61) Lewis H.7 JOHNS, (Lewis6 JOHNS, John5, Robert4, William3, Richard2, Roger1) was born at Tn, and on Nov 4, 1864 at Saline Co., IL, married (117) Eliza A. HAMMOCK who was born at IL. (62) Susan7 JOHNS, (Lewis6 JOHNS, John5, Robert4, William3, Richard2, Roger1) was born Sep 8, 1838 at Springfield, Tn, and on Jan 30, 1862 at Hamilton Co., IL, married (120) Jesse Luther COTTER who was born Mar 18, 1838 at Greene Co., Tn. Susan died on Mar 2, 1900 at Springfield, Mo and was buried at Clear Creek Cem., Greene Co., Mo. Jesse Luther died on Nov 6, 1928 at Glendale, Ca and was buried at Inglewood Park C.
Info from Diana JOHNSON, Tulsa, OK.
(63) Mary Jane7 JOHNS, (Lewis6 JOHNS, John5, Robert4, William3, Richard2, Roger1) was born at Hamilton(?) Co., IL, and on Jun 28, 1857 at Hamilton Co., IL, married (131) OTHANIEL WILLIAMS. (64) George W.7 JOHNS, (Lewis6 JOHNS, John5, Robert4, William3, Richard2, Roger1) was born at IL, and on Mar 24, 1868 at Saline Co., IL, married (132) Margaret M. BAKER. (72) Nancy McDaniel7 JOHNS, (John6 JOHNS, John5, Robert4, William3, Richard2, Roger1) was born in 1826 at Amherst Co., Va, and in 1850, married (133) Martin L. SCIVALLY. (73) Anson Tinsley7 JOHNS, (John6 JOHNS, John5, Robert4, William3, Richard2, Roger1) was born Apr 18, 1828 at Amherst Co., Va, and at Bono Twp., Lawrence Co., In, married (134) Mary Ann NEWKIRK who was born in Nov 1840 at Indiana. Anson Tinsley died in 1900 at Nebraska. Mary Ann died at Nebraska. Notes for Anson Tinsley JOHNS: Info from Shari WILLIAMS. (74) SOPHIE Weston7 JOHNS, (John6 JOHNS, John5, Robert4, William3, Richard2, Roger1) was born in 1830 at Tn, and married (145) Wesley SHASTEEN. She also married (146) Joab MUSE. (75) Naomi Dillard7 JOHNS, (John6 JOHNS, John5, Robert4, William3, Richard2, Roger1) was born in 1833 at Tn, and in 1861, married (147) Thomas CUMMINGS. (76) William Harrison7 JOHNS, (John6 JOHNS, John5, Robert4, William3, Richard2, Roger1) was born in 1835 at Tn, and at Butte Co., Ne, married (148) Eliza Catherine DENNY. William Harrison died in 1924 at Belvedere, Franklin Co., Tn. (77) Wade Morris7 JOHNS, (John6 JOHNS, John5, Robert4, William3, Richard2, Roger1) was born in 1837 at Tn, and in 1865, married (149) Nancy F. THOMPSON. Wade Morris died in 1925 at Crossville, Tn. #36 John Shephed Johns' son #77 is incorrectly listed as Wide Norris. It should be Wade Morris and his death date is 2-6-1919. I have his Civil War Records and Pension Application, his marriage certificate, and his death certificate. This and his tombstone information is the same. I am his geat grand-granddaughter and I am researching also. He is buried in City Cemetary at Crossville, TN. I have records of his descendants. (78) Permelia Jane7 JOHNS, (John6 JOHNS, John5, Robert4, William3, Richard2, Roger1) was born in 1843 at Tn, and married (150) William CUMMINGS. (79) Mary Ann7 JOHNS, (John6 JOHNS, John5, Robert4, William3, Richard2, Roger1) was born in 1847 at Tn, and in 1865, married (151) Marcellus WHITENDE. (80) Martha Louisa7 JOHNS, (John6 JOHNS, John5, Robert4, William3, Richard2, Roger1) was born in 1849 at Tn, and married (152) James VAN HORN. (81) John Samuel7 JOHNS, Jr, (John6 JOHNS, John5, Robert4, William3, Richard2, Roger1) was born at Tn, and married (153) Sarah MAHONEY. John Samuel died at Creston, Tn. (89) William Jefferson7 JOHNS, (Thomas6 JOHNS, Jesse5, Thomas4, William3, Richard2, Roger1) was born in 1823 at Hawkins Co., Tn. (91) William James (Junius7??) JOHNS, (Rial6 JOHNS, Henry5, Thomas4, William3, Richard2, Roger1) was born in Dec 1838 at Hancock Co., Tn, and married (154) Elisa McCauley Wolfe. 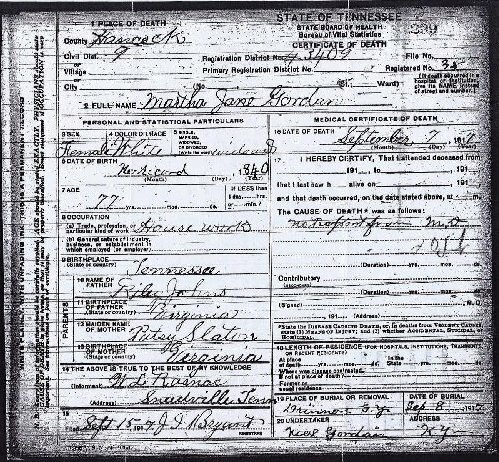 who was born in 1843 at Hancock Co., Tn. William James died in Jan 1934. Actually there was only one Wolfe in the family information that I gave you. My family is a direct decent of your Richard Johns page. I am going through your website because you have a lot of great information and let me add to some of this for you. On your site "Descendants of Richard Johns" page if you do a search Rail Johns had a son named William James Johns, you have something about Junius7 after James and I don't know what that is? Do you? But William James you have as being born in Dec of 1838 if you would like the day he was born on the 7th of December. he also Died on January 4th of 1934. His wife's name you just have Eliza M. her full name is Eliza McCauly Wolfe. I don't think there is any relation to the other Wolfe family. I have lots of information on the line from there, you state that you don't know of any kids for the two of them. They had lots of children and that is the information I had sent you previously. I will resend with dates and birthplaces when I get a chance should be real soon. Here's the listing of William James' and Eliza Wolf(e) kids. I also have the ancestry of Eliza if you'd like to see it. GRANDFATHER AND RELATED FAMILIES OF HANCOCK COUNTY TENNESSEE" by Newton P. Owen dated 8/1/1977 and revised 1 November 1978. Thanks again for all of your painstaking work on the lineage. b.10-17-1842 m. 6-14-1860 in Flat Gap, TN. 2.Martha Jane Johns b. 10-9-1862 m. (1) August Laer, m. (2) George Huff. 2.Mary Catherine Johns b. 12-28-1866 m. Charles Bernard Doche No issue. Eliza b. 1842 was the daughter of Nicholas Wolfe b. 1811 and Nancy Greene b. 1818. Her two siblings were: George W. b. 1838 and Joshua Tucker b. 1840, I have a picture of the three taken together. Nicholas was the son of George Sr. Wolfe b. 1765 and Mary Poly McCoy b. 1770. George Sr. was the son of John Peter Wolfe b. in Germany about 1730. She also married (156) Charles WILDER who was b. 30 JUL 1843 in Hancock County, Tn.,d. 31 AUG 1925 in Morristown, Tn. (93) Martha7 Jane JOHNS, (Rial6 JOHNS, Henry5, Thomas4, William3, Richard2, Roger1) was born in 1840, and on Sep 4, 1860, married (159) Samuel Gordon. Martha died in Sept. 7,1917 in Hancock Co., TN. View Death Certificate of Martha Jane Gordon HERE. I was looking at your gedcom on the Johns faimily. I have a question about Martha Johns and her marriage to James D. B. Debow. Was there a latter marriage to Sam Gordon? I am almost sure that Martha Johns was my Great Grandmother and the daughter of Rial Johns. From family traditions, I am sure that the Martha that was burried at the Drinnon cemetery is my Great Grandmother. I am not challenging this but wondering if there is a second marriage or I have some wrong information. Thanks for all of the information that you have on the internet. Thanks for your reply. I know how it is to be busy. I just retired as of the last day of Dec. and I start part time work this week. I was mostly concerned if there was a second marriage. I am almost sure that my Great-Grandmother Martha Johns was a daughter of Rial. She was married to Sam Gordon and 1880 the were living close to other Johns. My father, Aunts & Uncles were close to some of the Johns. I remember Lee Johns of Morristown as being a cousin and a close friend to the family. I would have to look at the information. I saw a death record of Martha Gordon that died in 1917. I think that her as a daughter of Rial. My father told me of the time she was visiting his family in Hawkins county and got homesick for Handcock county and he went with her part or all of the way to Handcock. She must have lived her last years with her sister family for she is buried in a Drinnon grave yard in the Mulberry community. I have saw the information of the cousins marrying and may have it. Some of this family has been at least close to my sister. I have not heard anything about the Johns being considered Melungeon. It would not surprise me very much. Some of the Johns families in VA may have been Melungeon or the name was listed as such. My Mathis family was some sort of mixture. In 1850 census in Hawkins county my great-great Grandfather Joel Mathis' wife Martha and the children were listed as mulatto. Joe the only son moved to Hancock before 1880. His oldest daughter was my grandmother that married Lee Gordon the son of Martha & Sam. I am not sure about Sam's parents. I think that he is Sandy that is listed in the 1850 & 60 census. I do have some information but not on the computer. My sister typed it from some of the works of Newton Owens and she added some. I am not sure what she added. I think that you have most of it but I would share. I would need your address. Just took a look at my information. William and Lee were Brothers. (94) Joseph7 JOHNS, (Rial6 JOHNS, Henry5, Thomas4, William3, Richard2, Roger1) was born in Jan 1844 at Hancock Co., Tn, and married (160) Eliza WOLFE who was born about 1840 at Hancock Co., Tn. Joseph died in Nov 1925 at Hancock Co., Tn. (95) Lucinda Lucy7 JOHNS, (Rial6 JOHNS, Henry5, Thomas4, William3, Richard2, Roger1) was born in Oct 1845 at Hancock Co., Tn, and married (162) Greenbury GREENE, who was born in 1847 at Hawkins Co., Tn. Lucinda Lucy died in Jan 1926 at Middlesboro, Ky.
Notes for Greenbury GREENE: Green Berry Greene was killed during the Jones and Greene War, in Hancock Co. Tn. I'm tying to fill in some blanks on the Drinnon side of the family. (100) Nancy Ann7 JOHNS, (Rial6 JOHNS, Henry5, Thomas4, William3, Richard2, Roger1) was born Mar 30, 1855 at Hancock Co., Tennessee, USA, and married (169) George W. WOLFE, son of Grandpa WOLFE and Grandma WOLFE, who was born Aug 29, 1855 at Hancock Co., Tn. Nancy Ann died on Jun 13, 1940 at Mooresburg, Tennessee, USA and was buried at Meadow Branch C., Mooresburg, Tennessee, USA. (101) Rev. John Rial7 JOHNS, (Rial6 JOHNS, Henry5, Thomas4, William3, Richard2, Roger1) was born in Nov 1860 at Hawkins Co., Tennessee, USA, and on Nov 15, 1885 at War Creek, Hancock Co., Tennessee, USA, married (174) Betsy Elizabeth (Sarah) TURNER who was born in Oct 1862. Rev. John Rial died on Sep 11, 1939 at Brushy Creek, Clinton, Tennessee, USA and was buried at Hinds Creek, Clinton, Tennessee, USA. Betsy Elizabeth (Sarah) died on Feb 14, 1941 at Morristown, Tennessee, USA and was buried at Brushy Creek, Clinton, Tennessee, USA. The old John Rial Johns house in Tazewell Tennessee has been renovated, not restored, and is on Straight Creek Road. The house was built approximately 1890. (102) Elizabeth Slaton7 JOHNS, (Rial6 JOHNS, Henry5, Thomas4, William3, Richard2, Roger1) was born Apr 19, 1863 at Hancock Co., Tennessee, USA, and on Dec 14, 1881 at Hancock Co., Tennessee, USA, married (180) George LIVESAY, son of Andrew Jackson LIVESAY and Alla MCGINNIS, who was born Sep 24, 1856 at Hancock Co., Tennessee, USA. Elizabeth Slaton died on Feb 14, 1957 at Knoxville, Tennessee, USA and was buried at Greenwood Cem., Knoxville, Tennessee, USA. George died on Jun 12, 1928 and was buried at Greenwood Cem., Knox Co., Tennessee, USA. Notes for George LIVESAY: He was in the Mercantile business in Luther, Hancock County, Tennessee. Soon after he was married they moved to Tazewell, Claiborne County, Tennessee, where he entered the Produce business, and from there moved to Knoxville, Tennessee. He was in the same business, with his sons until his death.